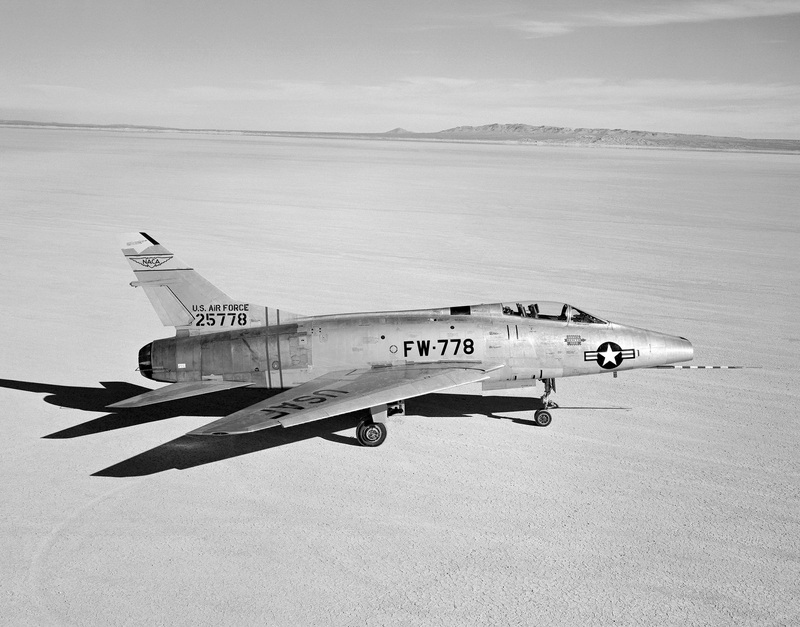 8 September 1954: Scott Crossfield, a NACA Aeronautical Research Pilot at the High Speed Flight Station, Edwards Air Force Base, California, took the North American Aviation F-100A-5-NA Super Sabre, 52-5778, on its first NACA test flight—and his first flight in an F-100. 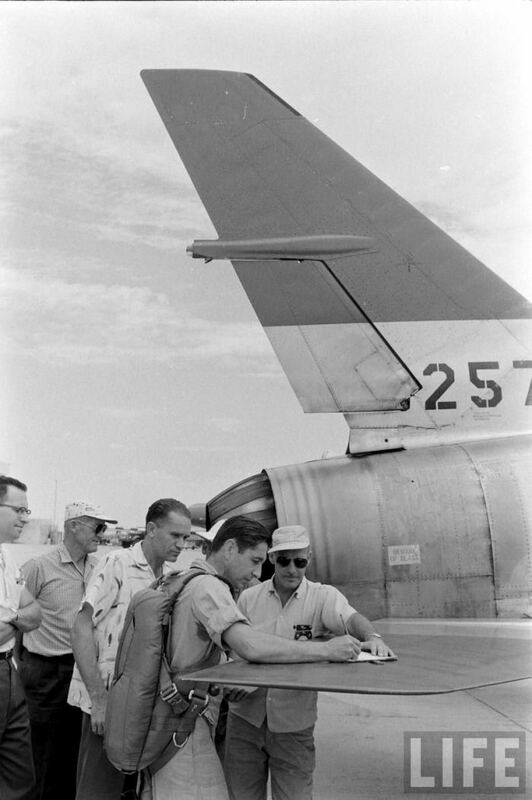 Tests of the prototype and early production Super Sabres revealed directional stability problems, a very dangerous inertia coupling characteristic that could cause the aircraft to go violently out of control (and which would result in the death of North American’s chief test pilot, George Welch, in just another three weeks). The highly swept wings could stall at high angles of attack, causing the airplane to pitch up in the deadly “Sabre dance”. NACA wanted to explore the causes of these aerodynamic problems and design solutions. During the flight there was an engine fire warning and Crossfield shut down the Pratt & Whitney J57-P-7 turbojet engine. 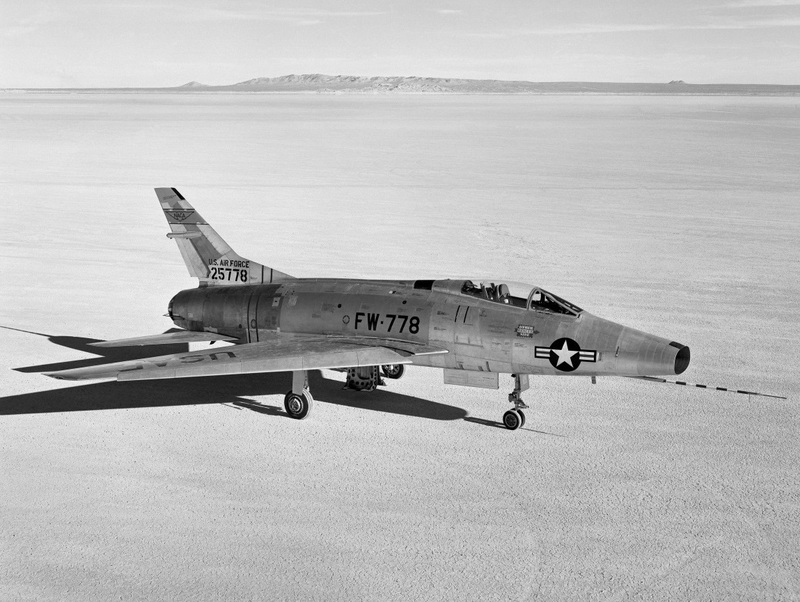 The F-100A had no flaps and North American’s own test pilots did not think a “dead stick” landing was possible due the very high landing speed required.
. . . As a matter of fact, North American tests pilots were then flipping coins to see who would bring an F-100 in dead-stick to fulfill a requirement of the Air Force acceptance tests. I was not concerned. Dead-stick landings in low L-over-D [Lift-over-Drag] airplanes were my specialty. Every test pilot develops a strong point. I was certain that my talent lay in dead-stick landings. With the engine idling and generating no energy to the plane’s systems, I was running out of hydraulic pressure to operate the controls. Following the handbook instructions, I pulled a lever which extended a miniature “windmill” into the slipstream. This “windmill” churned, building up pressure in the hydraulic lines. Unknown to me, there was a major leak in the line. The windmill was not helping, but hurting me. It was pumping hydraulic fluid overboard as fast as it could turn. I called Edwards tower and declared an emergency. All airborne planes in the vicinity of the base were warned away from the lake area. I held the ailing F-100 on course, dropping swiftly, following the glide path that I used for the dead-stick Skyrocket. [Douglas D-558-II Skyrocket] I flared out and touched down smoothly. It was one of the best landings I have ever made, in fact. 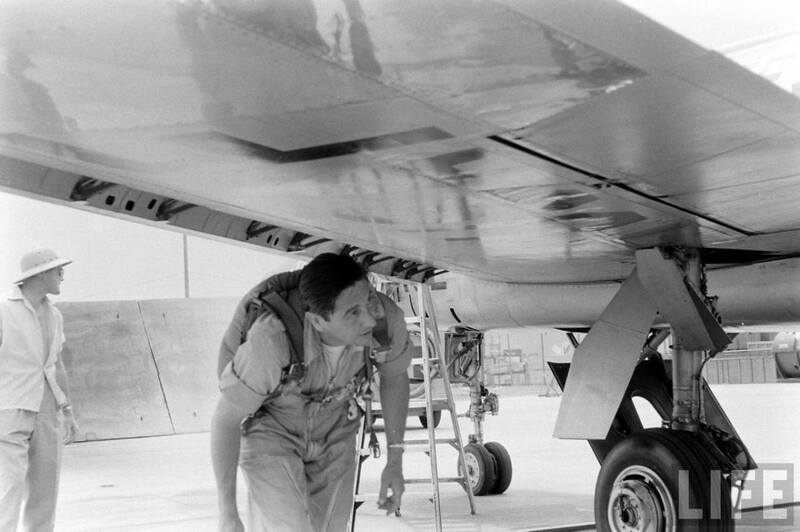 Seconds later, while the F-100 was rolling out, the remaining bit of hydraulic pressure in the control lines drained out and the controls froze. I then proceeded to violate a cardinal rule of aviation: never try tricks with a compromised airplane. The F-100 was still rolling at a fast clip, coming up fast on the NACA ramp, when I made my poor decision. I had already achieved the exceptional, now I would end it with a flourish, a spectacular wind-up. I would snake the stricken F-100 right up the ramp and bring it to a stop immediately in front of the NACA hangar. This trick, which I had performed so often in the Skyrocket, was a fine touch. After the first successful dead-stick landing in an F-100, it would be fitting. 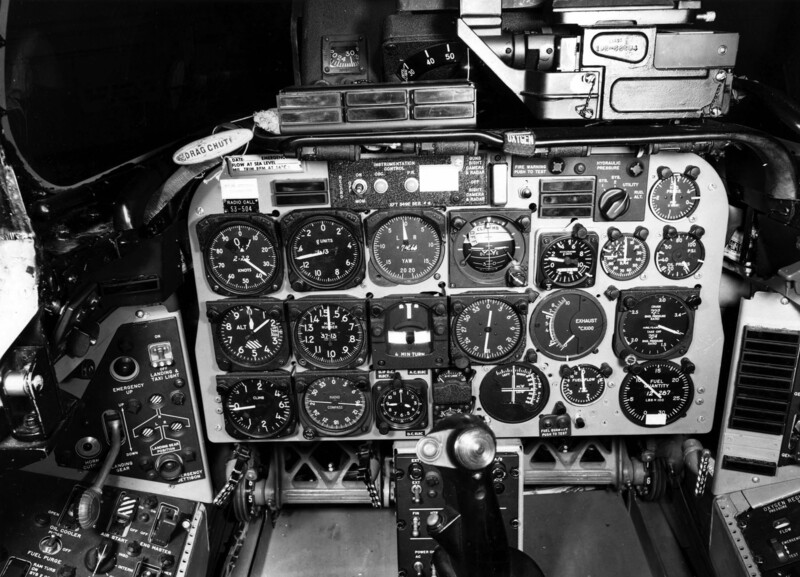 According to the F-100 handbook, the hydraulic brake system—a separate hydraulic system from the controls—was good for three “cycles,” engine out. This means three pumps on the brake, and that proved exactly right. The F-100 was moving at about fifteen miles an hour when I turned up the ramp. I hit the brakes once, twice, three times. The plane slowed, but not quite enough. I was still inching ahead ponderously, like a diesel locomotive. I hit the brakes a fourth time—and my foot went clear to the floorboards. The hydraulic fluid was exhausted. 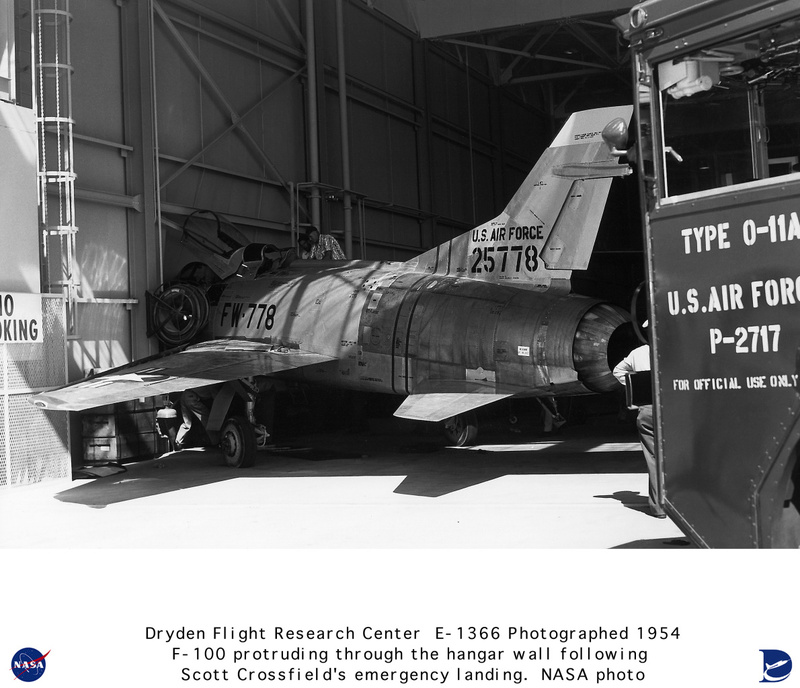 The F-100 rolled on, straight between the yawning hangar doors! The good Lord was watching over me—partially anyhow. 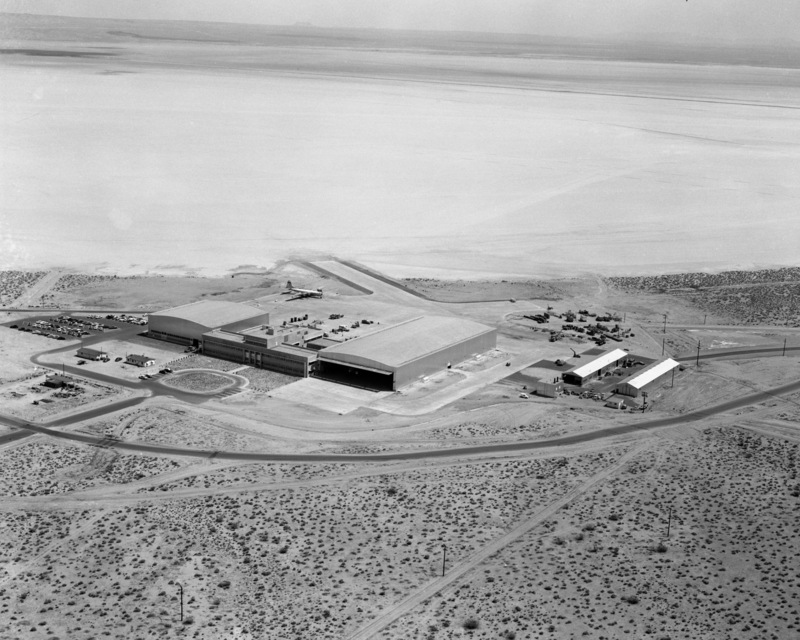 The NACA hangar was then crowded with expensive research tools—the Skyrocket, all the X-1 series, the X-3, X-4 and X-5. Yet somehow, my plane, refusing to halt, squeezed by them all and bored steadily on toward the side wall of the hangar. 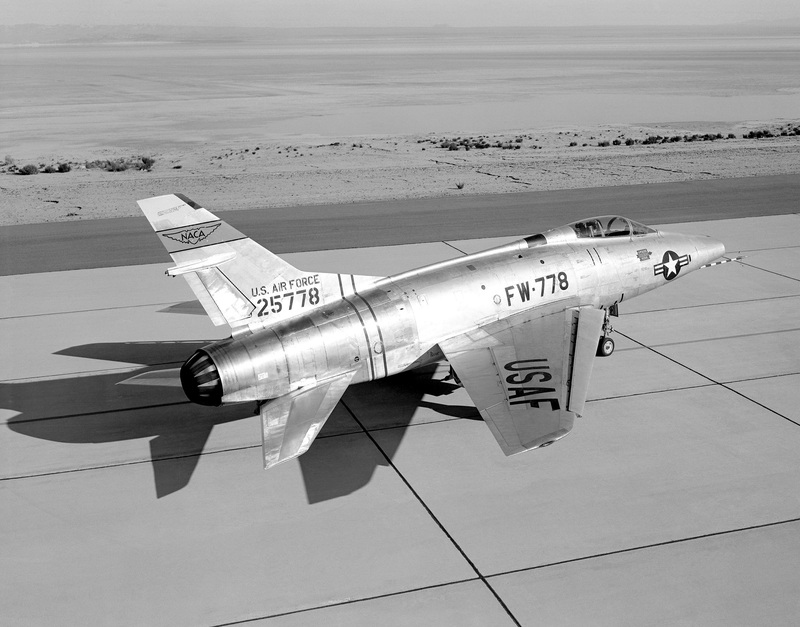 The nose of the F-100 crunched through the corrugated aluminum, punching out an eight-inch steel I-beam. I was lucky. Had the nose bopped three feet to the left or right, the results could have been catastrophic. Hitting to the right, I would have set off the hangar fire-deluge system, flooding the hangar with 50,000 barrels of water and ruining all the expensive airplanes. Hitting to the left, I would have dislodged a 25-ton hangar-door counterweight, bringing it down on the F-100 cockpit, and doubtless ruining Crossfield. Chuck Yeager never let me forget the incident. He drew many laughs at congregations of pilots by opening his talk: “Well, the sonic wall was mine. 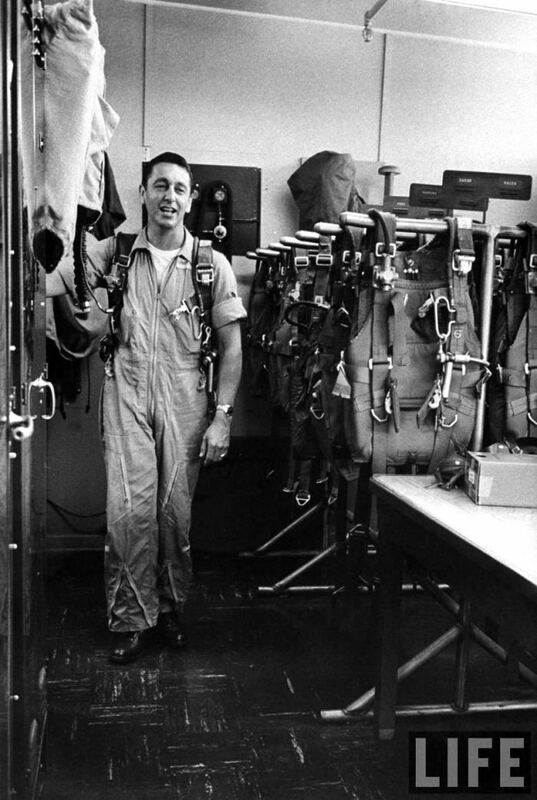 The hangar wall was Crossfield’s.” That’s the way it was at Edwards. Hero one minute, bum the next. 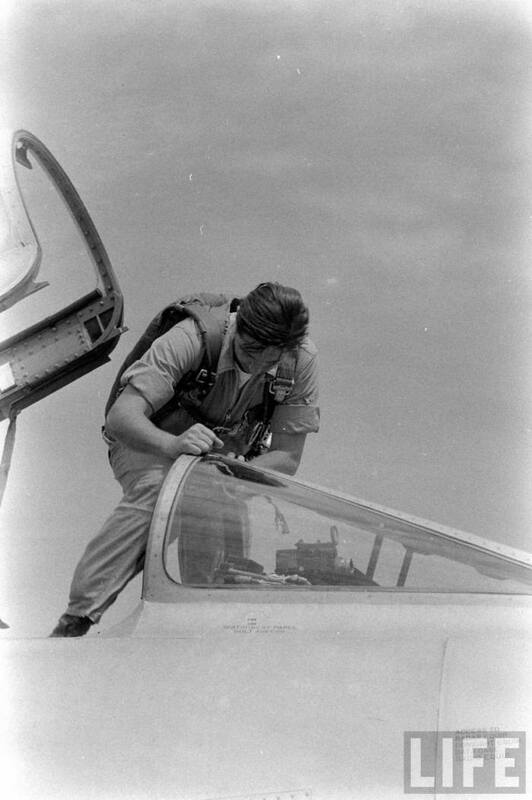 That I was the first pilot to land an F-100 dead-stick successfully, and memorized elaborate and complete instrument data on the engine failure besides, was soon forgotten. The F-100 is a tough bird. Within a month NACA’s plane was flying again, with Crossfield back at the helm. In the next few weeks I flew forty-five grueling flights in the airplane, pushing it to the limits, precisely defining the roll coupling. (On one flight the coupling was so severe that it cracked a vertebra in my neck.) These data confirmed, in actual flight, the need for a new F-100 tail, which North American was planning to install on later models of the airplane. —Always Another Dawn, The Story Of A Rocket Test Pilot, by A. Scott Crossfield with Clay Blair, Jr., The World Publishing Company, Cleveland and New York, 1960. Chapter 20 at Pages 196–199.